JNN 20 Jan 2014 Damascus : In recent weeks Russia has stepped up supplies of military gear to Syria, including armored vehicles, drones and guided bombs, boosting President Bashar al-Assad just as rebel infighting has weakened the insurgency against him, sources with knowledge of the deliveries say. Moscow, which is trying to raise its diplomatic and economic influence in the Middle East, has been a major provider of conventional weapons to Syria, giving Assad crucial support during the three-year civil war and blocking wider Western attempts to punish him , for his stance of Keeping an Anti Zionist Stance . The new Russian supplies come at a critically fluid stage of the conflict, with peace talks scheduled for next week in Switzerland, the factious opposition losing ground, and Western support for the rebellion growing increasingly wary of the role played by foreign militants. Syria has even said some countries formally opposed to Assad have begun discussing security cooperation with his government. Several sources told Reuters that Assad’s forces had since December received deliveries of weaponry and other military supplies, including unmanned spy drones known as UAVs, which have been arranged by Russia either directly or via proxies. 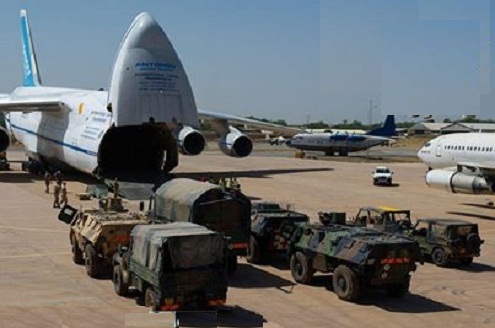 “Dozens of Antonov 124s (Russian transport planes) have been bringing in armoured vehicles, surveillance equipment, radars, electronic warfare systems, spare parts for helicopters, and various weapons including guided bombs for planes,” a Middle East security source said. “Russian advisers and intelligence experts have been running observation UAVs around the clock to help Syrian forces track rebel positions, analyse their capabilities, and carry out precision artillery and air force strikes against them,” said the source, who declined to be identified. Vyacheslav Davidenko, spokesman for Russia’s arms export monopoly Rosoboronexport, said they could not comment on arms deliveries to Syria. Russia has said it violates no international laws with its military supplies to Syria and does not sell Damascus offensive weapons. The U.S. State Department said it had no independent confirmation that Russia had increased military supplies to Syria but said such actions would be concerning if true. Spokeswoman Jen Psaki said she discussed the Reuters report with Secretary of State John Kerry earlier on Friday. A source within the international arms industry with knowledge of Middle Eastern weapons movements also confirmed a pick-up in supplies to Assad’s forces, including UAVs. Arms trackers say Bulgaria, Romania and Ukraine all have stockpiles of Russian-style light arms that were produced in the countries dating back to the Soviet era, when factories were set up with help from Moscow. A Bulgarian foreign ministry spokesman said Bulgaria’s intergovernmental council, which oversees arms trades, had not issued any certificates for arms deals destined for Syria. “We have data that shows that Bulgaria has not authorized any arms sales to Syria,” he said. Former foreign minister Solomon Passy said it was “very unlikely” that Bulgaria, as a NATO and EU member, would be involved in such shipments. A Ukraine foreign ministry spokesman said the former Soviet republic had already denied allegations of arms supplies and transfers last year, when it said Kiev had voluntarily and completely stopped military and technical cooperation with Syria since May 2011. Romania’s foreign ministry said its export control department had not registered or authorized any foreign trade operations involving military products, including light weapons, with Syria during 2013 or 2014. A Syrian opposition source said some supplies had been delivered to Syria’s Latakia airport around three weeks ago, with further equipment reaching through the country’s major cargo ports in Tartous and Latakia. The source said the port of Tartous, which is also the location of Russia’s naval base, had been sealed off for several hours over three to four weeks ago. C4ADS’s Wallace said past shipments of Russian military cargo had also come by both air and sea. “Lighter, less sturdy equipment often is loaded onto a plane, whereas large and heavy shipments typically are loaded onto a ship of some kind,” he said. “Wheeled vehicles would need to be transported on a roll-on, roll-off ramped ship, but most smaller stuff could be containerized and loaded onto a standard cargo ship,” said Wallace, who co-authored a recent report into arms transfers from Russia and Ukraine. This entry was posted in Europe, Middle East and tagged bashar al asad, Insurgency, Military Supplies, Russian Military Aid, Syria, Weapons Supplies. Bookmark the permalink. RUSSIANS ARE MAJORITY ATHEISTS BUT EVEN THEY HAVE SENSE OF JUSTICE,ARMING SYRIAN BASHAR AL ASSAD IN CRUSHING THE FORCES OF YAHOODI-SAUDI WAHABIS . NOW THIS INCREASED SUPPLIES OF LETHAL ARMS WILL END THE INTERFERENCE OF THESE INFIDELS AGAINST THE JUST REGEME OF BASHAR AL ASSAD WHO IS ON LY DEFENDING HIS COUNTRY AGAINST AGGRESSION . MAY ALLAH STRENGHTHEN THE HANDS OF BASHAR AGAINST NATHAL ZIONIST SAUD.